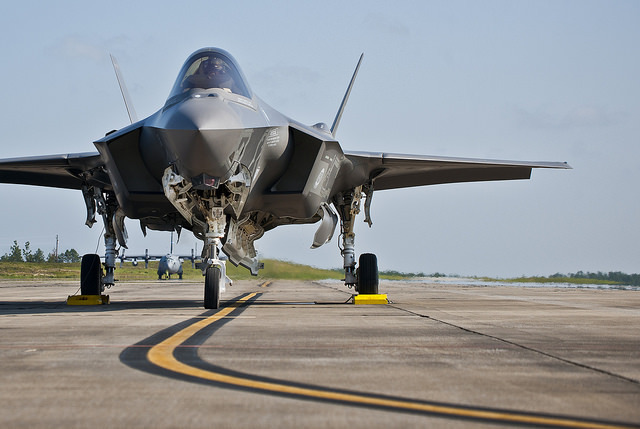 The Senate Foreign Affairs, Defence and Trade Committee is holding an inquiry into the planned acquisition of the F-35 Lightning II (Joint Strike Fighter). ASPI has had a keen interest in this project for over a decade, so we made a submission (available here). The public discussion of the F-35 is a curious mix of diametrically opposed views—either the F-35 is the biggest folly ever to attract funding, or it’s a game-changing platform about to turn traditional notions of air combat on their head. It’s fair to say that the public submissions to the inquiry are heavily weighted towards the former. Those views can’t both be true (though they can both be wrong). For a couple of reasons, we decided not to enter the debate about the merits of the F-35 as a platform in our submission. First, and in common with the most vociferous critics of the aircraft, we don’t have the data required to do so. Second, and more important, there aren’t a lot of options in any case. It’s either the F-35, or something from an earlier generation of combat aircraft design—an unappealing option for an air force looking to recapitalise an ageing fleet of 1980s built Hornets. We note that some of the public submissions suggested that the answer lies in the USAF’s F-22 Raptor. While it’s impressive, it’s expensive to maintain (with costs per flying hour about the same as a B-52), suffers from low (but improving) availability, is long out of production, and is not available for export. And if that’s not impossible enough, the RAND Corporation estimates that new build F-22s could cost US$276 million each (2019 dollars) compared to a projected US$90 million for an F-35 in 2019. 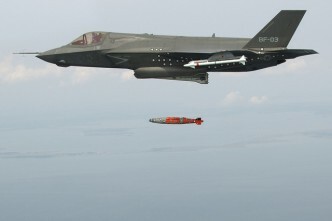 Having limited choices isn’t great, but it’s a direct consequence of Australia’s precipitous decision to go all-in for the F-35 back in 2002, shutting down a study into future air combat options that was in progress at the time. If it hadn’t been for then Defence Minister Brendan Nelson’s 2007 intervention—despite advice to the contrary from the RAAF (PDF, see p.71)—to buy an ‘interim air combat capability’ in the form of 24 F/A-18F Super Hornets, today’s RAAF’s air combat force would be much less capable, given that the F-111 was retired six years ago. ASPI last looked at the F-35 acquisition in detail back in 2014, when the Abbott government approved the purchase of 58 aircraft. At the time our best judgement was that the F-35 had put many (not all) of its development problems behind it. 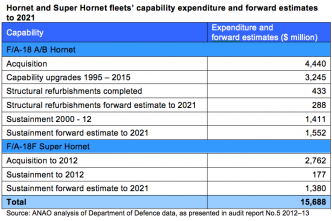 We judged that the timetable for an Australian acquisition had enough leeway to allow for a few more hiccups and still deliver before the A/B model Hornets reach the end of their lives in the early 2020s. We don’t see any need to change Australia’s current plan at the moment. 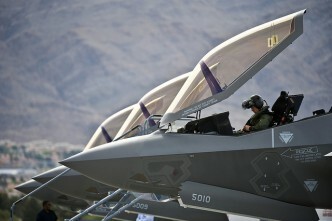 The F-35 remains the RAAF’s best choice for its future air combat capability. Further delays to F-35 delivery could drastically limit [Australia’s] possible responses in the early 2020s, and a capability gap is a possibility. 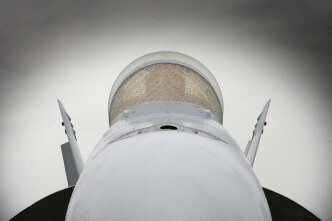 As a prudent hedging measure we recommend that Defence gather data regarding the window of opportunity for future orders of an additional tranche of Super Hornets. The idea of a second tranche of ‘interim’ aircraft will no doubt receive the same response from the RAAF as did the first. The RAAF has its eyes firmly set on the F-35 and probably won’t welcome any suggestion of deviating from that course. But we don’t think it would necessarily be a bad thing, and it would certainly be better than running out of serviceable jets sometime around 2023. As our colleague Malcolm Davis pointed out last week, it’s not too early to start thinking about what comes after the F-35. 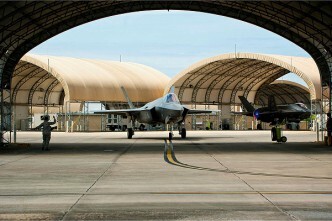 The F-35 would’ve been a world beater if it had been delivered to the USAF in 2007 as originally planned. It might still be a world beater, but there’s no doubt that the margin has narrowed as competitors have built their first stealth aircraft and develop counter-stealth technologies. 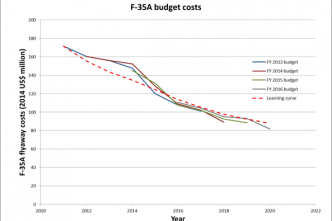 The ‘lost decade’ will have consequences for the longevity of the F-35. So instead of an all-in approach on the F-35 (that ship sailed when the Super Hornets were ordered anyway), we wonder if there’s another answer that’s more ‘future proof’. A mix of 50 Super Hornets and 50 F-35s, with the Super Hornets to be replaced around 2030 by 50 of ‘whatever comes next’, might be worth contemplating. In any case, some contingency planning is in order. Andrew Davies is senior analyst for defence capability and director of research at ASPI. James Mugg is a researcher at ASPI. Image courtesy of Flickr user Samuel King Jr. 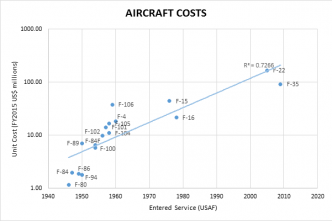 The F-35 and the dogfight—it matters! 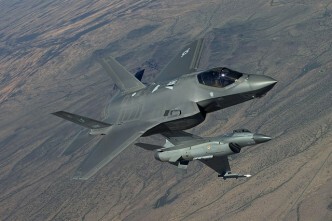 F-35 versus F-16: who wins? Who cares? Australia's air combat capability – the next step?